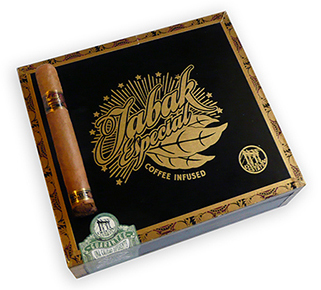 Tabak Especial is a very special cigar that Jonathan Drew worked on for over 5 years, perfecting all of the nuances that were learned in the making of Drew Estate's Kahlua and Java cigars. This newest coffee infused premium cigar is handmade using the very finest Nicaraguan tobaccos and robust Fair-Trade coffee, and the Dulce is wrapped in a smooth and silky Connecticut. The result is a medium-bodied, light, sweet blend with just the right touch of cream, sugar, and jolt you look forward to with your morning cup of coffee. Fans of the popular Kahlua brand of old will be pleasantly surprised by the familiar, yet more refined flavor profile you'll experience with the Tabak Especial Dulce cigar.